Pork Chops with Lemon/Soy Glaze, Thyme for Cooking piquant main dish. This has a piquant sauce: dark, spicy, salty, sour, wonderful. The pork chops I use are thin, about 3/8" (3/4cm). If yours are thicker increase cooking time to 15 minutes. 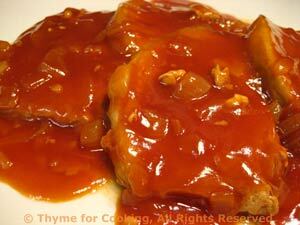 Combine soy sauce, lemon juice, stock and tomato paste in a dish. Add pork chops turning to coat and allow to marinate. Sauté onion, garlic and ginger in oil in large skillet over medium heat. Add pork chops (reserving marinade) and brown - pushing onion mixture to sides of pan to prevent burning. Add reserved marinade and cook, covered 8 - 10 minutes longer or until done. Thicken pan juices by adding cornstarch mixture and stirring well. Pour over chops and serve.